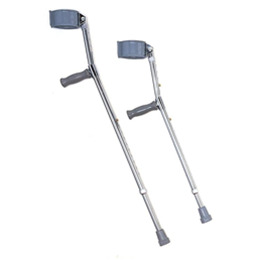 The adult forearm crutches are adjustable in height and made out of lightweight aluminum. They are for users between the heights of 5'3" and 6'2" and are sold in pairs. The weight of the pair of crutches is 3.8 lbs. The tip size for these crutches is 20022.